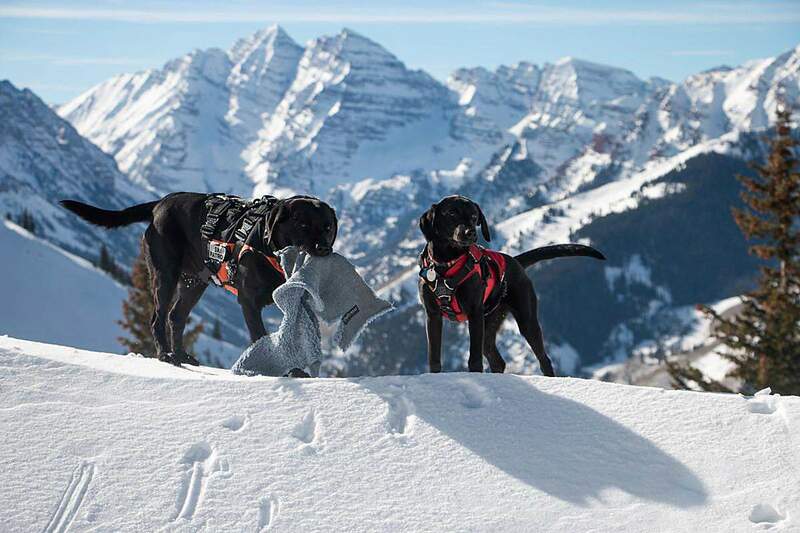 River and Moxie survey the slopes of Aspen Highlands with the Maroon Bells behind them. ASPEN (AP) – They are celebrities of the ski runs. Beloved by locals and visitors alike, by both kids and their parents, these stars of the slopes have a very important job to do on the mountains. They even have their own trading cards. But for these champions of the chairlift, it’s all just a game. They are the dogs of ski patrol. Among the four ski areas of Aspen, Aspen Highlands, Buttermilk and Snowmass, there are an average of nine dogs trained to respond in case of an avalanche or other snow disaster, the Aspen Daily News reported. The number of dogs on each mountain varies, depending on the size of the ski area, with Snowmass having the most on average and Aspen the fewest. The dogs are not owned by the Aspen Skiing Co., but by their patrol handlers, who are also responsible for the training. Spence, who is in her 34th season with the patrol, has a dog of her own, Meka, and is one of the leaders in the dog program. Meka is a high-energy black Lab, and Spence said that a feisty spirit is one of the main things she looks for when selecting a dog to train for rescue work. Black Labs make up the majority of the dogs on Highlands, but the breed is completely up to the handler and varies by mountain. Brad Benson, a lead patroller on Aspen Mountain, is the proud owner of Zoot, an Airedale. Zoot, who is one of the older dogs on the mountains at nearly 9 years old, is Benson’s second Airedale, a breed he chose to work with because he grew up around them. “I’m looking for one that really wants to play with me, how excited they are about the reward,” Benson said. The reward is the most important part of their training, because even though they may be saving lives, the dogs simply view rescues as playtime. Ski patrol trains the dogs by digging holes in the snow at the mountaintop. The dog is then held back while the handler goes and hides in the hole, dragging a piece of clothing behind them and encouraging the dog the whole way. Once the handler is hidden out of site, the dog is released and goes to find the handler, who will use the piece of clothing (often donated by Susie’s Consignment Shop) to then play tug-of-war with the dog as a reward. When the dog is comfortable finding his or her handler, they move on to other patrol members, who are hidden completely – and the dog’s handler is as unaware of the hole as the dog. The dogs are trained to use their noses and dig for the person, and one test for certification involves the dog finding two people in 20 minutes. Spence said full certification can take two to three years. There is basic and advanced certification, and Benson said the dogs are, for the most part, evenly split on those certifications currently, mainly because of dogs new to the program. Although there are plenty of slope veterans like Zoot and Sienna – a yellow Labrador who turned 9 on Christmas and is coming up on retirement – the fresher faces on the slope include Moxie, a black Lab who, at 5 months old, is the youngest pup. Moxie, whose handler at Aspen Highlands is Tim Hugo, is still very much learning the ropes when it comes to rescuing avalanche victims. However, she is doing her best to help out with the dogs’ secondary role: a face of ski patrol. Spence explained that the dogs spend much of their working day greeting people who stop by the patrol buildings, as well as skiers taking lessons. Benson also said the Aspen Center for Environmental Studies brings classes of second-graders who learn about ski patrol and skiing safety and meet the dogs. The pooches ride the chairlifts up in the morning and spend the morning playing or doing rescue exercises. The early afternoon is spent either in a kennel or meeting people, and then they get to play some more and will head back down the mountain. Spence said an important part of training the dogs is getting them used to different types of transportation, so that they will be comfortable on snowmobiles, toboggans and even riding on their handler’s shoulders while they ski. During wintertime, they are hardworking rescue animals, but in the summers, the dogs get to relax and just be “family dogs,” Spence said. Zoot spends his summers hanging out with Benson at his construction job, but he said the dog gets bored during the warm months and can’t wait for winter to roll around again. “Our first walk back into the locker room in the fall, he’s charging in, barking, ‘I’m here, I’m here, I’m here,’” Benson said. Spence said she has worked with Garfield County to get Meka trained as a search-and-rescue dog in the summer, but that the primary job of the mountain-rescue dogs is just that. For anyone who is overly excited to meet the dogs of ski patrol after learning about them, Benson said that people are always welcome to stop by a ski patrol building or volunteer to help with the dogs. “We’re always looking for ‘victims’ to go into our holes,” he said. At the end of the day, the ski patrol dogs are a lot of things. They’re heroes, PR advocates, family dogs and, of course, they are a big part of the ski patrol family.